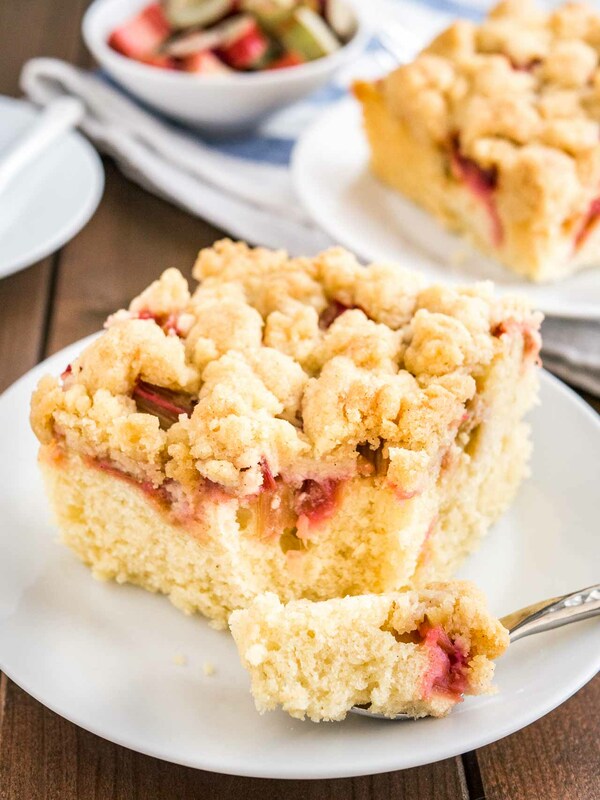 Rhubarb Coffee Cake is topped with cookie-like streusel and every bite is studded with juicy rhubarb! An easy-to-make sheet cake that’s not too sweet and not too tangy, just delicious. 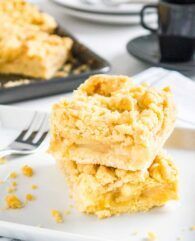 Rhubarb Coffee Cake is my favorite coffee cake when rhubarb is in season! 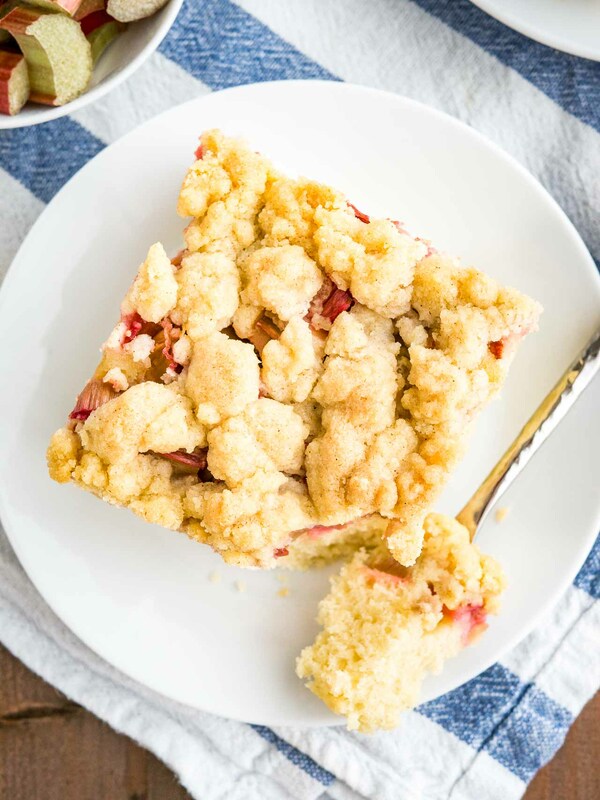 It bakes high and fluffy with a delicious crunchy streusel and a juicy layer of fresh rhubarb. 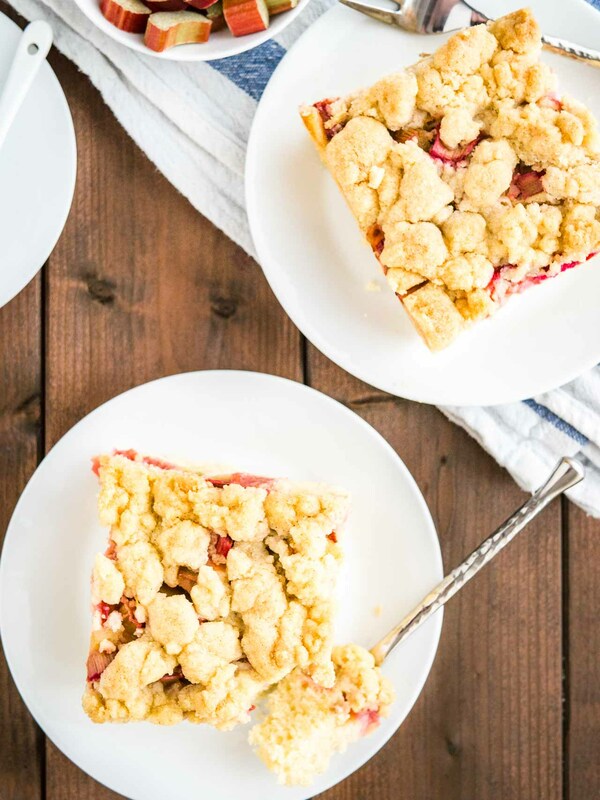 This rhubarb-and-streusel-topped sheet cake is not only easy to make from scratch in less than 20 minutes but it’s also a perfect dessert to make in advance. It tastes even better on the next day! 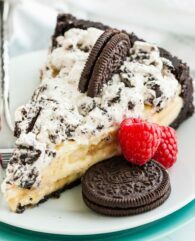 You will love the cookie-like topping! My go-to streusel is a traditional German streusel that is made with less sugar than an American crumb topping and is made without nuts. It bakes up into little cookie-like shortbread balls. So delicious! 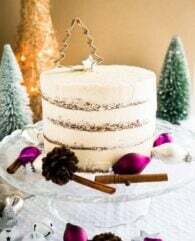 I love simple cake recipes like this that come together quickly, are not too sweet, and are perfect for unexpected guests. This cake makes a great afternoon snack, brunch treat, or dessert. 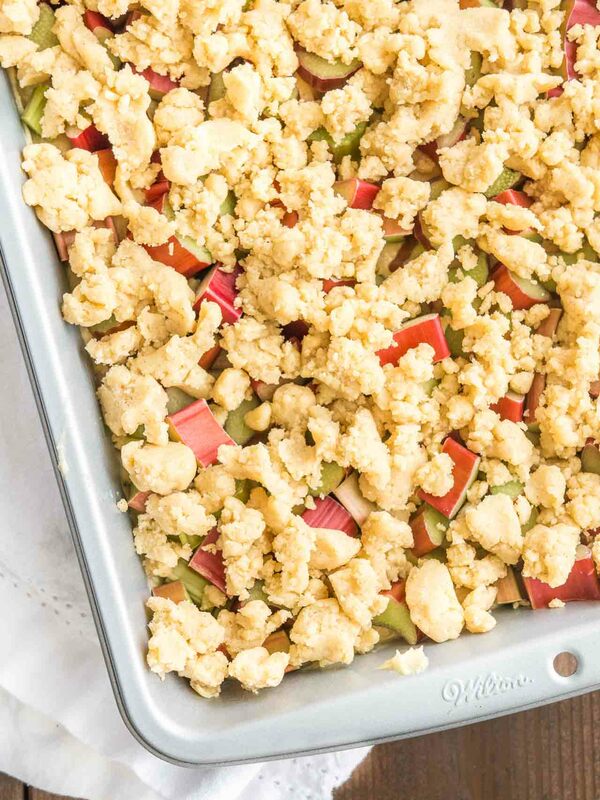 My favorite thing to make with rhubarb besides cake is my easy Strawberry Rhubarb Crisp. It’s definitely one of the easiest and best desserts you can make with rhubarb! To make this Rhubarb Coffee Cake you need a 9×13-inch baking pan. This size of cake works great for a party. You can also half the recipe and bake it in an 8×8-inch baking pan. The rhubarb keeps the cake moist and fresh so you could also make this cake one day in advance and store it covered at room temperature. If you are not a big fan of rhubarb you can top this cake with berries or chopped peaches or try my Lemon Raspberry Cake. It makes a perfect alternative for this cake is made with the same streusel topping. Serve it with a big dollop of homemade whipped cream and you have the perfect summer dessert! The most beautiful appliance in my kitchen! I own it in the gorgeous Ice Blue but the new Imperial Black one is my current favorite color. : This is my favorite vanilla extract. I also love their vanilla sugar for recipes where I don’t want to add more liquid. Preheat the oven to 350°F and grease a 9x13-inch baking pan. Set aside. In the bowl of a stand mixer fitted with the paddle attachment combine butter, sugar, vanilla extract, and eggs. Mix for 3-4 minutes at medium speed until combined. In a small bowl combine flour, baking powder, and salt. With the mixer running at low speed, alternately add flour mixture and milk in two portions. Mix until just combined. Don't overmix. Pour batter into prepared pan and spread evenly. Top with sliced rhubarb and spread evenly. To make the streusel, combine flour, sugar, vanilla extract, salt, cinnamon, and butter in a bowl. Mix for 2-3 minutes until all the flour is incorporated. Distribute the streusel evenly over the rhubarb. Bake for about 45-50 minutes, or until a toothpick comes out clean. Let cool then serve with whipped cream or vanilla ice cream. 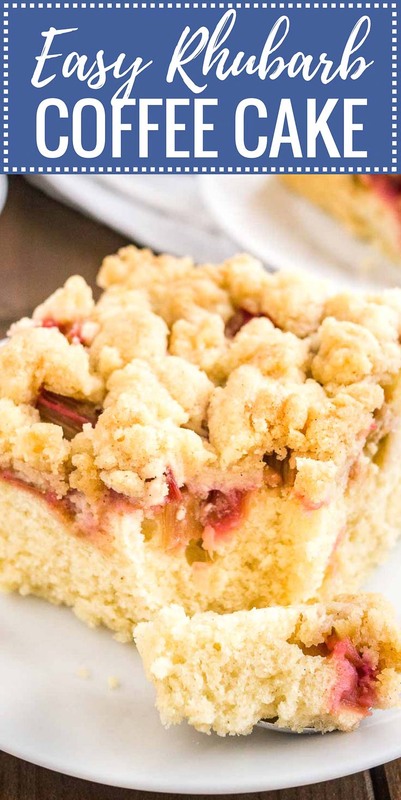 WANT TO TRY THIS RHUBARB COFFEE CAKE? PIN IT TO YOUR CAKE OR DESSERT BOARD TO SAVE FOR LATER!